Indoor air quality (IAQ) can be worse than outdoor (or ambient) air quality (AAQ) due to the many sources of pollution within buildings and homes. Clean Air in London (CAL) is therefore campaigning to build public understanding of indoor air quality with support from Camfil Farr. CAL does Pollution Checks to investigate air quality. The most common forms of indoor air pollution include: fine combustion particles from traffic and power stations (PM2.5); volcanic dust; bio-aerosols and pathogens like pollen, bacteria, viruses and fungal spores; environmental tobacco smoke (ETS); asbestos; and silica dust. Molecular pollutants such as gases and vapours include: carbon monoxide; oxides of nitrogen (NOx) and sulphur; ozone; radon; and volatile organic compounds (VOCs). The World Health Organisation has published two reports titled ‘WHO guidelines for indoor air quality’. These have addressed ‘dampness and mould’ and ‘selected pollutants’ in 2009 and 2010 respectively. While AAQ assessment typically focuses on particle mass concentrations and gases there is increasing concern among scientists about the health impact of higher particle number concentrations and surface area among smaller particles. Without filters, up to 50% (and much more in some cases) of air pollution found indoors comes from outside. IAQ can be further affected by: tobacco smoke from indoor smoking; combustion (such as gas cooking or candles); water systems, leaks and condensation; and substances emitted from some building materials, furnishings and cleaning agents. Indoor concentrations of some pollutants can be much higher than outdoor (e.g. 10 or 20 times higher in the case of formaldehyde). European citizens spend on average over 90% of their time indoors so 75% or more of the health impact of AAQ can therefore occur indoors. According to the Mayor of London, domestic gas combustion (e.g. from cooking and heating) in turn contributed 22% to ambient air emissions of NOx in Greater London in 2008. The five year EnVIE project published a major report titled ‘Co-ordination action on indoor air quality and health effects’ in February 2009 with an update titled ‘Promoting actions for indoor air quality (IAIAQ)’ in 2011. These reports aimed to increase understanding of the Europe-wide public health impacts of IAQ by identifying the most widespread and significant causes for these health impacts and evaluating the existing operational building and housing related policies for controlling them. EnVIE estimated the UK as having the worst health effects of the EU 27 countries for ‘non-ideal’ IAQ for asthma and chronic obstructive pulmonary disease (COPD) and among the top three worst for sick building syndrome and respiratory infectious diseases. The same report estimated the UK as having the worst contribution to exposures for bio-aerosols and among the top three worst for VOCs and pathogens. EnVIE ranked the UK worst for the following sources of indoor air pollution: water systems, dampness and mould; ventilation and conditioning systems; and building materials and among the top three worst for: AAQ; furnishing, decoration materials and electric appliances; and cleaning and other household products. British and European standard BS: EN 13779:2007 specifies different grades of particle and gas filters for non-residential buildings depending on AAQ and desired IAQ. To achieve high IAQ in cities with ambient air exceeding EU limit values by 50% requires a two stage particle filter with a gas filter to achieve average reductions of 80%, 90% or 95% in particles of 0.4 microns in diameter (which compares with the thickness of a human hair of about 70 microns). It is important to remember a building may have air conditioning, mechanical ventilation and/or air filtration or any combination of these (or none of them). IAQ standards are supported by BS:EN 779:2012 which sets a minimum efficiency e.g. removing 35%, 55% or 70% of particles at 0.4 microns. Higher quality, low energy air filters, such as those made from glass fibre, together with a large surface area to reduce pressure drop (so-called ‘bag filters’), can achieve and sustain much higher particle efficiencies at lower total lifetime cost (as energy may use up to 70% of total cost). Ultraviolet light may eliminate some pathogens but do little or nothing to eliminate particles or gases. Cheap synthetic filter materials may depend on electrostatic charge to comply with standards initially but lose their charge and require much more frequent replacement with all the associated maintenance and disposal costs. The efficiency of carbon filters depends on charcoal’s ability to retain gas molecules on its surface which in turn depends on the quality and surface area of charcoal and the type of gas, contact time and gas concentration. There is much policy makers can do to improve public health in non-residential buildings (and homes). EnVIE recommended: general policies (e.g. to build public understanding); building construction (e.g. integrate IAQ into policies on urban development and develop moisture control guidelines for buildings); ventilation (e.g. regularly inspect and maintain all heating, ventilation and air conditioning systems (HVAC), include EN 13779 compliant filters in HVAC systems, ban all unflued combustion heaters and integrate with energy performance inspections); consumer products (e.g. testing and labelling of products); and occupant behaviour, operation and maintenance (e.g. best practice manuals for major buildings). Further action is needed to reduce exposure to ETS (particularly for children). CAL is keen to encourage the European Commission, as part of its ‘Year of Air’ in 2013, to foster the role of filtration and the need to design systems so that they can integrate efficient air filters, as minimum requirements. This will become increasingly important as buildings become virtually ‘airtight’ to increase energy efficiency. Some policy makers are already taking action. 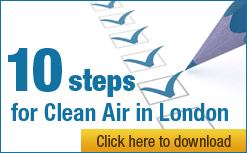 For example, the City of London Corporation has been working with City businesses to develop a list of simple, effective actions that can be taken by companies to improve air quality in a programme called CityAir. Its guide for building engineers and facilities managers highlights the need to ensure that air filters in buildings with mechanical ventilation are regularly maintained and comply fully with EN 13779. It also notes the legal requirement to inspect all air conditioning systems with a rated output of 12 kilowatts or more at least every five years (which is an obvious opportunity to review filter arrangements, if not before). The Mayor’s London Plan requirements for air quality published in July 2011 have also already had a positive impact. For example, a school is west London chose to use activated carbon filters, which Camfil Farr laboratory tests have shown can reduce NO2 by 95%, with a two stage particle filter in a development. CAL was surprised to discover though that only seven buildings in Transport for London’s ‘Head Office Portfolio’ were due to comply fully with EN 13779 by April 2012 with eight others in 2012/2013 and many more having no expected compliance date. CAL has also been surprised to discover a big difference among the 33 local authorities in London in terms of how much they know about indoor air quality standards in their buildings. Some have been able to provide quite detailed information on compliant buildings whilst others seem to have little idea of which buildings comply with EN 13779. Many local authorities have told CAL they do not know about compliance with EN 13779 in their schools because they are independently managed. CAL is therefore encouraging the London Assembly to investigate IAQ with a particular focus on health and energy savings. The investigation should consider buildings with existing mechanical ventilation and others where standalone or ducted air filtration may be needed. There is a tremendous opportunity to improve public health and save energy and money through the use of regularly maintained air filters that comply fully with EN 13779. This is the sixth in a series of article about air quality in London. Other articles include health impacts, legal issues, sources, solutions and the Olympics. Camfil Farr is the first Gold Sponsor of CAL and is supporting a campaign to build public understanding of indoor air quality, initially in London. Camfil Farr, a world leader in the development and production of air filters and clean air solutions for buildings, has also created a website called www.keepthecityout.co.uk which offers guidance and a wide range of resources on IAQ.